A number of circumstances have kept me from posting for a little over a year, and boy do I miss it. 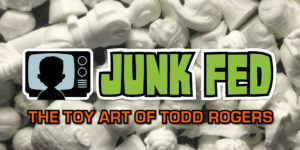 One of the things that has kept me busy lately is my toy art. Since my debut at C2E2 2015, I’ve been steadily creating for and tabling at a number of conventions across the country, the latest of which was Hartford ComicCONN (HCC), a smaller convention in my home state. I’m here on the other end of my extended pause to share a delightful encounter that occurred at HCC. I’m not really one for meeting celebrities at pop culture conventions. Of course it’s interesting to bump into people you’ve only seen on television or at the movies in person. Admittedly it was pretty cool bumping into Jerry Only of the Misfits at New York Comic Con. I glibly commented that, “somebody looks ready for Halloween.” He replied with a wink, a double click of the teeth, and a handshake. This exchange made me feel like we were on the same level. 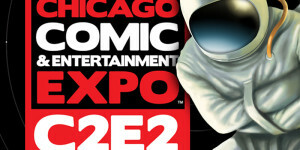 Similarly, I found it amusing that Jason Momoa chuckled at my RX-DX figure while scanning my wares at C2E2. If you think he’s a hunk on TV, you should see him in person. Even I felt weak in the knees. I didn’t queue up for hours to have them reluctantly smile through a paid-for photo op, and nor would I. Not that there is anything wrong with lining up to meet a celebrity. I just prefer organic encounters like these. Being a smaller convention, Hartford ComiCONN didn’t really pull in the blockbuster star power of the larger conventions, which is just fine by me. 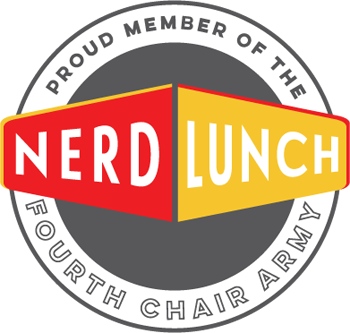 Among some of the celebrity guests were WWE’s Booker T, a genuinely intimidating living giant, Judith Hoag, best known as April O’Neil in the first Teenage Mutant Ninja Turtles movie, and Hollywood of Gorgeous Ladies of Wrestling. Upon meeting my booth mates Stacey and Brad Rader, the team behind Battle Babies, Hollywood was nice enough to walk back with them to our booth to see what we had to offer. Once again, a pleasant “common people” experience vs a staged encounter. 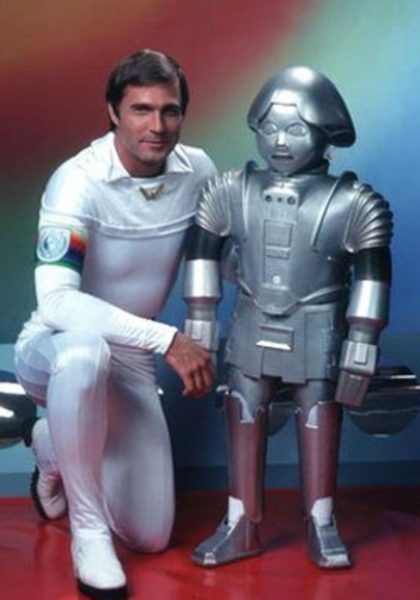 The only two celebrities on the HCC roster that interested me were Gil Gerard and Felix Silla known respectively for their roles as Buck Rogers and Twiki on the 1970s – 80s television show Buck Rogers in the 25th Century. My great fondness for this show meant that I’d at least have to walk by and catch a glimpse. Still, I didn’t feel the need to pay for a photo op or an autograph. I took a stroll by their tables and was shocked to see the inevitable passage of time in Gil Gerard. Nevermind the 25th Century, Buck Rogers got old here in the 21st! His brown hair had gone white, he slouched forward like a man with back troubles, and his face was speckled with age spots. Still, he was Buck Rogers and it was great to see him. 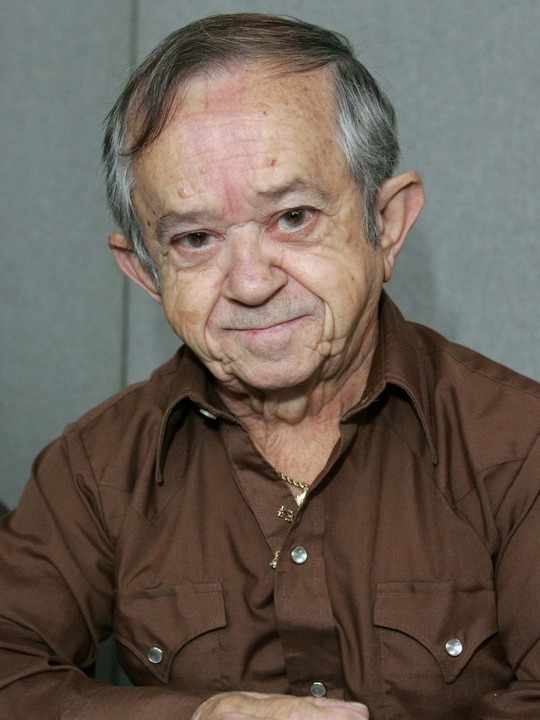 Felix Silla on the other hand, appeared spry for a man of 79. Being that most of his career was spent under makeup or hidden in a costume, the change in him was less jarring. 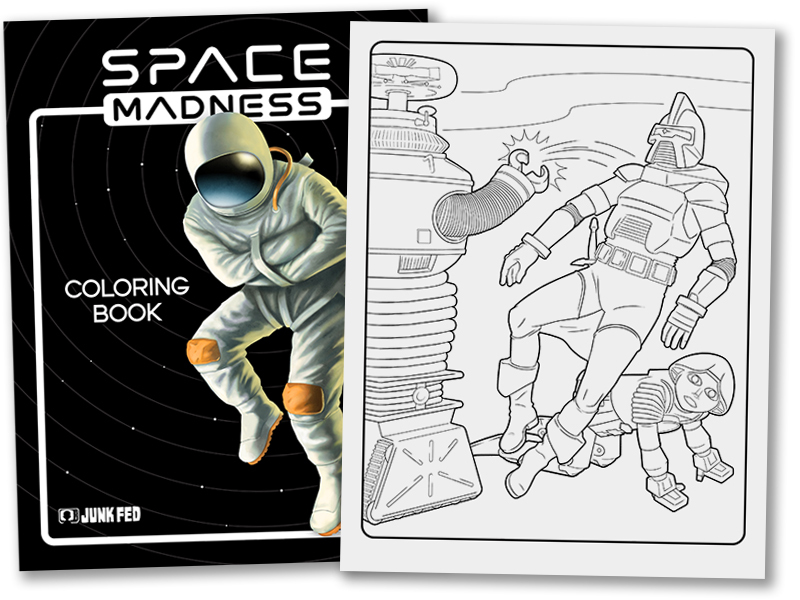 One of the items that I sell at conventions is my Space Madness coloring book, which features classic sci-fi film and television mashups. I remembered that one of the pages features Twiki, the robot played by Felix Silla. In it, the B-9 robot from Lost in Space pushes a Battlestar Galactica Cylon over Twiki, who waits on his hands and knees in the classic prank pose—the two usually benevolent robots in a moment of cyber-bullying. Encouraged by my booth mates, I decided to bring a copy of the coloring book to Felix as a gift, and approached his table with the book opened to his page. Laying it down before him, he seemed perplexed by the crossover of sci-fi charaters, pointing at Twiki and then the Cylon, a robot he was familiar with from his role as Lucifer on Battlestar Galactia. I explained that it was space robots getting revenge on a sci-fi baddie. He asked if I wanted him to sign the page for me, and I clarified that the book was a gift for him if he wanted it. He thanked me and we shook hands. It was an organic experience. Having accompanied me for the meeting, Brad lingered at the table easily conversing with Mr. Silla. 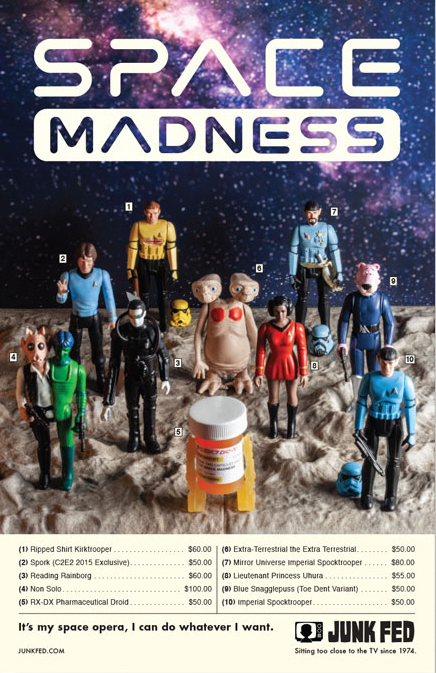 The table was covered with 8 x 10 glossy photographs of Felix in his numerous roles; as Cousin Itt on The Addams Family, the hang-gliding Ewok in Return of the Jedi, as a Child Gorilla talking to Charlton Heston on the set of Planet of the Apes, and of course Twiki. Looking over Brad’s shoulder, I noticed a photo of Felix as one of the Talosian captors in the original pilot episode of Star Trek, titled “The Cage.” I remarked that I hadn’t realized it was him under that iconic makeup. Felix responded noting that it was good working with Jeffrey Hunter, who played Captain Pike in that original episode. Delighted by his candid and unexpected insight, we thanked him and made our way to our booth giggling all the way. Other than the opportunity to spend time with friends, this brief exchange is the standout moment from Hartford ComiCONN. It was simple and very human and this thanks to a celebrity who made a career playing aliens and robots.